powered by Octa-Core Exynos 9610 processor with 4GB RAM,64GB storage / 6GB RAM with 64GB Storage. On Camera, it has a 25MP rear camera with LED flash, f/1.7 aperture, 5MP depth sensor with f/2.2 aperture, 8MP ultra-wide angle camera with f/2.2 aperture and 25MP front camera with f/2.0 aperture packed by 4000mAh Battery. 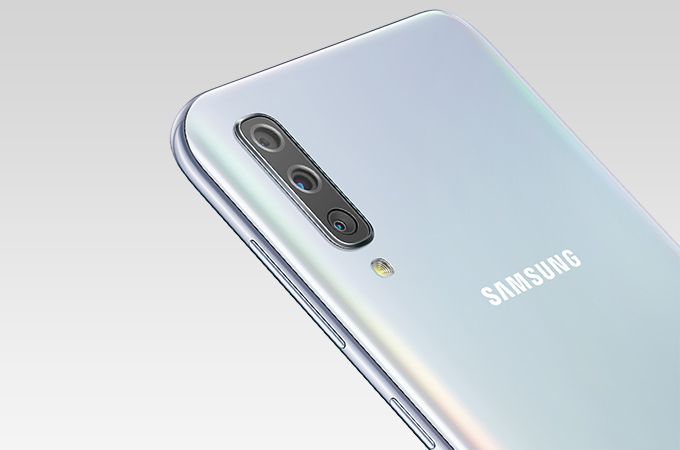 Samsung Galaxy A7 (2018) has a 6-inch Full HD+ Super AMOLED screen powered by a 2.2GHz Octa-Core Exynos 7885 Processor with4GB RAM,64GB Storage, 6GB RAM with 128GB of internal Storage. The main Camera is a 24-megapixel sensor with f/1.7 aperture, secondary 8-megapixel 120° Ultra Wide Lens for wide-angle photos and the third 5-megapixel camera to capture depth information for portrait shots. It also has a 24-megapixel front camera. Packed with a 3300mAh battery. Samsung Galaxy M30 comes with 6.4-inch (2340 x 1080 pixels) Full HD+ 19.5:9 Super AMOLED Infinity-U display powered by Octa-Core Exynos 7904 14nm processor with Mali-G71 GPU. It comes with 4GB RAM, 64GB Storage, and 6GB RAM, 128GB Storage which is further expandable with MicroSD card. On Camera, it has a 13MP+5MP +5MP Triple Rear Camera and 16MP front camera. Connectivity options include Dual 4G VoLTE, Wi-Fi 802.11 b/g/n, Bluetooth 5, GPS + GLONASS packed by a 5000mAh battery with fast charging support.